How to Play Jazz Flute. Jazz flute music can be cool and calm, or it can be bouncy and energetic. You can learn to play jazz if you're willing to invest the time. All it takes is determination, practice and the confidence to improvise. Listen to a lot of jazz flutists. Start with any recording by artists like Herbie Mann, Hubert Laws, Fathead Newman, Rahsaan Kirk and James Moody. "All jazz, all the time," should be your new motto. Practice your scales. Major scales, minor scales, harmonic and melodic, the ability to improvise jazz flute is based on your familiarity with these basic scales. Knowing your scales inside and out will help you with your improvisational playing which is incredibly important in the genre of jazz. Other scales you will want to learn include diminished, wholetone and pentatonic. These scales will also help you with your live improvisation. Memorize an easy song and figure our the chord pattern. Play the melody of the song repeatedly. After you have the song down, play a variety of scale patterns starting with those chords. This exercise stresses improvisational skills. Play along with your recordings. Enjoy playing with the greats of jazz music in your living room. Eventually you will want to find a little jazz band to jam with. Have fun and continue to experiment with your jazz flute playing. If you need more information on flute basics, see eHow's "How to Play the Flute." 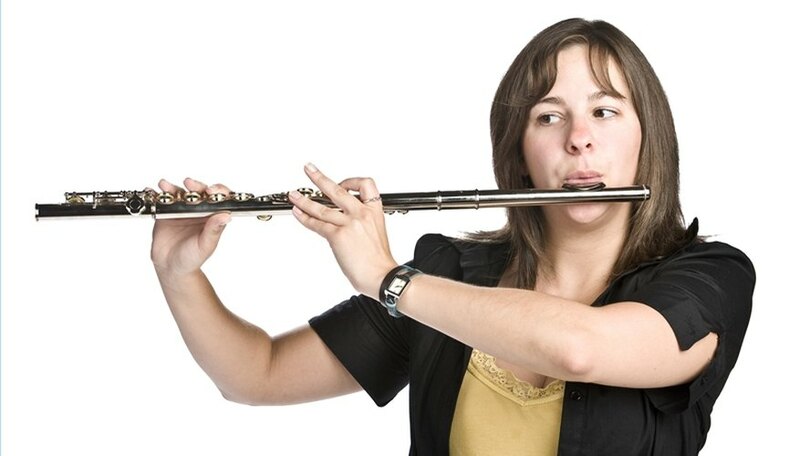 http://www.ehow.com/how_2044981_play-flute.html. Be patient. You didn't learn to play your flute in a day; you won't learn to play jazz flute in a day either.